Apologies to Bob Hawke – I left that old attention-seeker off the picture! One reason for this nuclear spinning is the fact that Australia will be expected to take back international wastes, as part of its uranium export industry. So, by getting Australia into the entire nuclear fuel cycle, this would make a smoother transition from “our” nuclear wastes, to “theirs” too. The radioactive waste question is becoming critical in Australia – with the government’s attempt to impose a dump on Aboriginal land, and with Lucas Heights wastes soon. due to return from England. The secretive talks between U.S. and Australian leaders included Australia’s participation in USA’s ‘star wars’ nuclear surveillance, future nuclear technology co-operation (read USA selling nukes to Australia) and probably, USA’s need to find a dump for its increasing mass of radioactive wastes. Nuclear spin is getting more sophisticated, especially in Australia. Australians happen to be more aware of the issues involved, even though the media obliges government and business by not publicising those issues. So, for example, we have the New South Wales government reclassifying the radioactive waste from Hunters Hill as “restricted solid waste”. Ziggy Switkowski’s pro nuclear spin is always worth scrutinising, particlarly in the areas that he omits to mention , or glosses over in a very superficial way. For example – the connection between nuclear reactors and nuclear weapons, the unsolved problem of nuclear wastes, the costs of nuclear wastes. I heard Ziggy spinning, a few months ago, and marveled at the fact that he actually understands very little about global warming and climate change. In fact, Ziggy, like most of these wonderful ‘hard’ scientists, is not interested in the subject. Climate change gets a mention solely because it is used as an excuse for promoting nuclear energy. by Dr Jim Green Why is it that whenever Ziggy Switkowski talks up nuclear power – which is all the time – he gets another round of media? Couldn’t we take it as read that he supports nuclear power? Switkowski says co-location of reactors with existing gas or coal-fired power stations is likely. There is at least one problem with that: existing fossil fuel-fired plants are already stressing water resources in several states and nuclear is the thirstiest of all energy sources. A report prepared by the Parliamentary Library in Canberra found that nuclear power plants consume 20-83% more water than coal-fired plants. A typical reactor consumes 35-65 million litres daily. Switkowski dismisses the weapons proliferation risks by asserting that only two nuclear technologies are proliferation sensitive – uranium enrichment and reprocessing of spent fuel – and Australia has no plan to pursue either. But reactors are required to produce the plutonium which a reprocessing plant separates from spent fuel or other irradiated nuclear materials. 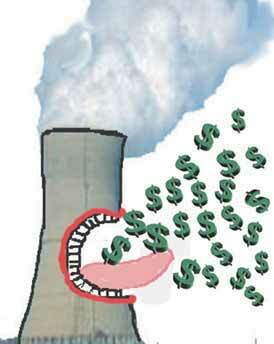 A typical reactor produces enough plutonium each year to build 30 nuclear weapons. A small reprocessing capability already exists at the Lucas Heights site operated by the Australian Nuclear Science and Technology Organisation (ANSTO). 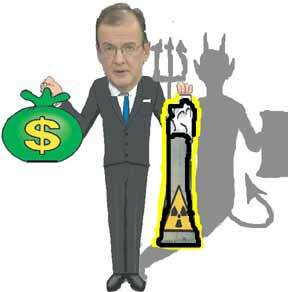 Switkowski says a typical reactor produces a volume of radioactive waste roughly the size of a family car each year – but he ignores the 716,000 tonnes of low-level radioactive tailings waste generated to produce the uranium to run just one reactor for just one year (assuming the uranium is sourced from Olympic Dam). Switkowski notes that no repository for high-level nuclear waste exists anywhere in the world but “several will open in the next decade.” There is no chance of even one such repository opening in the next decade let alone several. Finland and Sweden are possibilities in a 10-20 year timeframe. The US was the furthest advanced with its Yucca Mountain project, but that was a US$11 billion scandal-plagued fiasco which was 23 years behind schedule when President Obama permanently abandoned the planned repository earlier this year. Switkowski concludes: “Previous studies have asserted that in the carbon-costed world of the 2020s, nuclear energy will be Australia’s safest, cleanest and lowest cost form of baseload electricity generation.” Yes, that would be the report produced by the Switkowski panel in 2006, wouldn’t it, Ziggy?